When you’ve been blogging for as long as I have, you start to have some topics that you’ve covered fairly well in the past, and so you shy away from repeating them. Or at least, you think you’ve covered them fairly well in the past. Imagine my horror when I looked back over my years of blogging and discovered that I’d never taken the time on my wife’s birthday to devote a blog post to wishing her Many Happy Returns of the Day. I guess I always just assumed I’d done it last year, so I didn’t want to repeat myself. I shall rectify that right now. Because what I was planning on blogging about either which way was the fact that some topics just never lose interest. People are always like that. You experience them new each day. True, sometimes you might try to classify them–to make assumptions about what they’ll do or say. But people never fail to surprise you. Do things you didn’t think they would. Denisa and I have been together for quite some time now, and each year is different than the last. Through them all, she’s been an awesome partner to have. She’s incredibly multitalented and diverse, able to do so many things well that I can’t do well at all. She’s a fantastic cook, wonderful teacher, superb mother–you run out of synonyms for “excellent” really quickly with her. She’s compassionate, thoughtful, cheerful–she’s practically the Boy Scout Law incarnate. Just with fewer merit badges–or a higher concentration of the cool ones. She’s willing to put up with living with me, which means far more pop culture than I think she ever knowlngly signed up for, and while I go to the occasional dance with her, she’s watched the entire series runs of Battlestar Galactica, Buffy the Vampire Slayer, Veronica Mars, Firefly, and even some Star Trek with me–not to mention numerous viewings of Lord of the Rings, and the perpetual Groundhog Day celebration. I think if you’d asked her before she met me if she would do all of that, she would have laughed in your face. This is the woman who still hasn’t seen Return of the Jedi, after all. And yet she’s watched them all and even likes talking about them. That’s dedication and love, folks. So everyone join me in wishing her a very happy birthday. She generally doesn’t like it when I draw too much attention to her, so I suppose I really ought to wrap this up. I’m probably already going to get in trouble for posting the picture of her and her birthday cake. She’ll object to it being bad lighting, or a bad angle. What she doesn’t seem to understand sometimes is that she’s gorgeous and lovely in any lighting and from any angle. 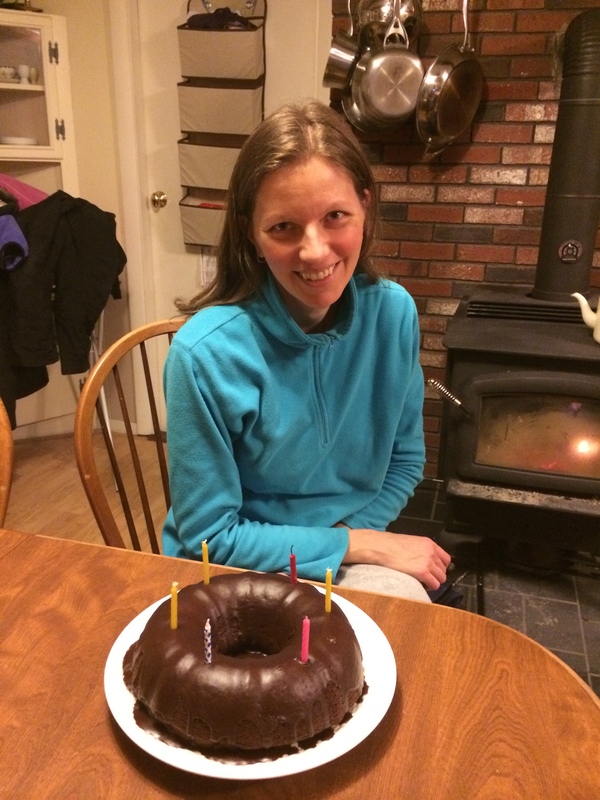 And besides–what’s a happy birthday blog post without a picture of a cake? I ask you! You’re the best, Denisa. I love you.